Figuring out where can you rent a pony for a birthday party is something you may need to do if you're planning a party with animals in the theme. Ponies are excellent entertainment for a child's birthday party that has a safari theme, circus theme, western theme or petting zoo theme. Keep your money in your area by checking into local places that may have pony rentals available. For example, if you know somewhere you can rent a monkey for a birthday party, call and ask about pony rentals. Even if the particular company does not offer pony rentals, they may be able to refer you somewhere that does. Entertainment companies that furnish clowns, magicians, hypnotists, etc. Parents who are unsure of where to begin looking for pony rentals for a birthday party might want to begin with the Internet. The local phone book and referrals may not encompass all the options available. Several websites offer help finding pony entertainment. GigMasters offers listings for Animals For Parties by state. Search for results by major city or county. Business results are sorted by location, and include ratings, short descriptions, general pricing information and press kit links. Photographs are usually included with results. The Pony Rides & Traveling Petting Zoo Directory at Festivals-and-Shows.com lists a number of places to contact regarding pony rides across the country. Information included for all listings is the area served, contact phone/email and a description of services offered by each business. Critterplaces allows users to select their state in order to find out where can you rent a pony for a birthday party. Narrow your results by selecting "Pony Rides" in the Category section, entering your location, or by adding a keyword or two. Short descriptions and a photograph/graphic are included in the results. If something you want is not included in the rental itself, ask if you can add it on for an additional fee. Decide whether the additional fee is worth having the company provide it or whether it is more cost-effective to do it yourself. If you end up visiting a party place for kids that has the pony on their own site, find out whether decorations, food and favors are included. Some companies provide those services, while others do not. Also, check the party time limitations. saddles with buckles or a safety harness? Remember to get all liability forms from the company prior to the party. Have each child and his/her parent fill them out completely before the party begins. Call your homeowner's or renter's insurance agency to see if accidents are covered under your policy. If the company does not have adequate coverage, you may end up being personally liable for accidents. 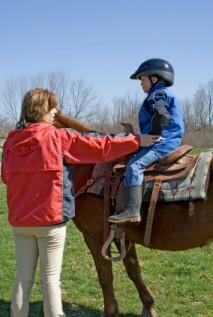 A pony rental is a wonderful addition to a themed child's birthday party. Perfect for toddlers through ten-year-olds, kids will remember a party that includes a pony ride for many years to come. Grab your camera and be sure to snap pictures of this memorable birthday event.